In a culture full of technology and distractions the simple act of looking up is becoming a lost art. Yet tilting your head back to peer at something immense and mysterious, whether a person or the sky, should feel natural: that's what we all did for the first 10 years of our lives. Once the world was a marvel, now we just strive to find answers. Recently while stargazing, and waiting for the Persieds to blip across the sky, I felt expansive and fascinated in a way I hadn't for a long time. I realized that just as there is a vastness full of curiosity above us, there is the same vastness and curiosity inside us, sometimes we just forget it's there. The solar eclipse is giving us an opportunity to look up and experience a very special (and magical, as I would have said when I was little) part of the universe, and ourselves. This is a time to let our curiosity out and let the wonder in! Where will you be on August 21, 2017? Wherever you are (if you happen to be on the North American Continent) you are gonna want to look up. 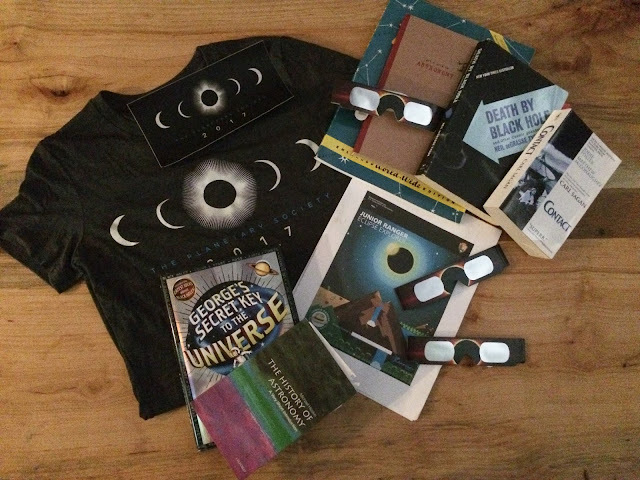 We've gathered references, resources, information, and inspiration from some of our go-to science favorites like Scientific American Magazine, Bill Nye and The Planetary Society, U.S. National Park Service, the original Bad Astronomer Phil Plait of PBS Crash Course Astronomy & SyFy Wire, and of course, our book shelves. The Culture of Science and Get Out and Look Up! Eclipse 2017: All the way across North America! How to know where to go and what time? "If you can, plan your primary destination to be the closest place within your range of travel with the best climatological conditions. Then, watch the short-term weather forecast starting a week before and adjust your target destination if necessary. And maybe hope for a little luck: As the moon begins to partially cover the sun, a phenomenon called “eclipse cooling” begins: The lowering of air temperature may dissipate a thin cloud layer and save the day." Read more tips for viewing from Scientific American, click here. How to I get my kids to look up and understand how special this is? Don't worry, you have help. The Planetary Society and the U.S. National Park Service have partnered up for the very first time to pool their resources and inspiration to help us all get out and look up. Ever want to be a Park Ranger... well here is your chance to become a National Park Service Junior Ranger. 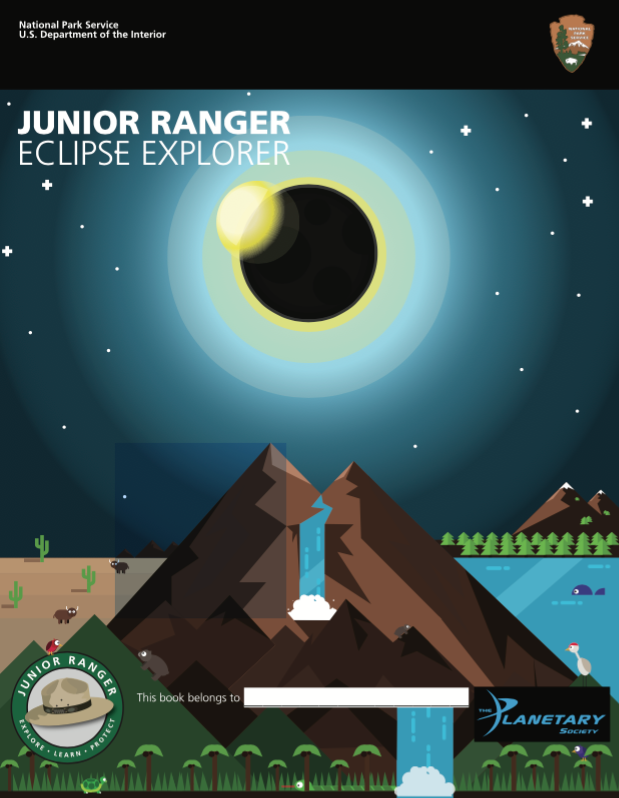 Get the Junior Ranger Eclipse Explorer Book, full of fun and engaging activities, geared toward the curious and youthful of all ages. LEARN: Phil Plait breaks down what an eclipse is. If you like this video consider watching PBS Crash Course Astronomy entire series, we did and whew, the course and Phil Plait are simply brilliant --we dare you to watch just one and try not to get hooked. Now you know what the eclipse is and where to look, but how to look? Shop carefully for glasses: Trust the America Astronomical Society, "your eyes are precious! You don't need astronomers to tell you that, but you do need astronomers to tell you where to get safe solar filters:" click here for the list from AAS. "Here's a simple and safe way to observe a partial eclipse that's appropriate for young children with no eclipse glasses or other special equipment needed." Emily Lakdawalla of The Planetary Society explains, "throughout the exercise, kids safely face away from the Sun." Click here to DIY your own Pinhole Projector or watch the video! We're learning about how to use (read: not get distracted by) Twitter. 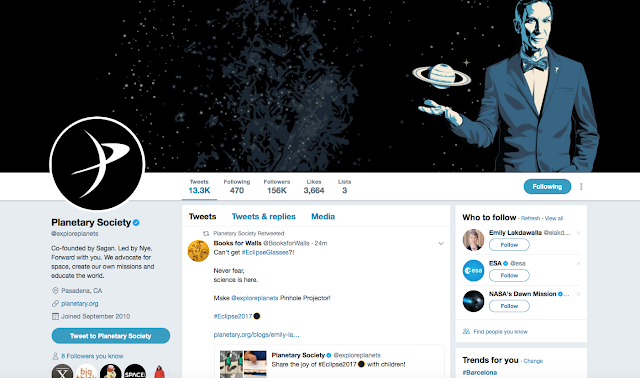 @booksforwalls tweeted and yup, @exploreplanets retweeted, that was cool. George's Secret Key to the Universe by Stephen and Lucy Hawking (Stephen's Daughter!) Get it at the library. Contact by Carl Sagan Get it at the library. Death by Black Hole by Neil de Grasse Tyson Get it at the library. Get a Grip on Astronomy by Robin Kerrod (The illustrations call you to pick up and explore astronomy.) Get it at the library. Learn more about The Sister's experience with the National Park Service Junior Ranger Program. Explore www.booksforwallsproject.org, where everyday is a good day to read a book. Join us.